Because I practice holistic veterinary medicine people often ask me if I avoid using conventional treatments and diagnostics in favor of all-natural approaches. As a rule, I use whatever treatments are best, in a holistic sense, for the horse. Holistically, that means I use treatments that lead to cure rather than those that just palliate or suppress symptoms. I have found that combining both natural and conventional treatments often produces the best results. 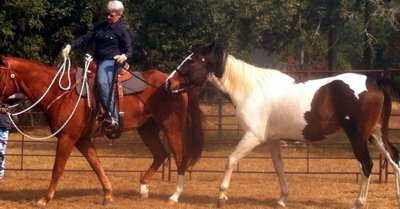 This month I'm featuring a complex case, on a mare called Kate, which called for just such an approach. Kate is a seven-year-old QH mare and she was scheduled to foal in early May. About seven weeks before her due date her owner, Rita, noticed some swelling in her right udder. Kate tends to be an easy keeper and my first thought was that the spring grass was triggering insulin resistance, since hormonal imbalances can be one sign of this condition. We pulled Kate off the grass and started her on milk thistle to support her liver. After several days Kate was no better and both sides of her udder were swollen. I became concerned that Kate could have some inflammation in her placenta and that this might actually cause her to abort the foal. I changed Kate's herbal supplement from milk thistle to uva ursi to help reduce the edema. I also started Kate on banamine and antibiotics to treat the placenta. After five days of treatment, Kate seemed slightly improved but I still had concerns. We brought Kate up into a stall so we could feed her hay only. We also drew blood for a CBC, basic profile glucose, and insulin level. On the hay-only diet and with overnight stall confinement, Kate's udder swelling decreased significantly. I was sure the grass was the problem and that Kate had insulin-resistance but all the bloodwork came back normal. When Kate was turned back out into the paddock, the swelling returned and she began to drip a serum-like fluid from her left teat. I was still concerned about a problem with the placenta so Rita scheduled an appointment with Dr. Luann Groves on March 24 for an ultrasound. Dr. Groves' exam did indicate a mild increase in the thickness of the placenta, suggesting an infection and/or inflammation. 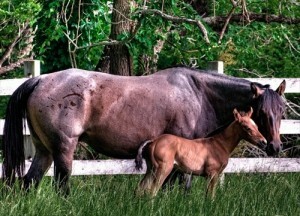 Even a slight thickening of the placenta could interfere with the blood supply to the foal so Dr. Groves prescribed strict stall confinement, antibiotics, and the synthetic progesterone, Regumate. Kate was still five weeks away from her due date and we wanted to keep her from foaling early. A re-check of Kate's bloodwork indicated that her blood protein levels were low, and I felt this could be contributing to the edema in her udder-this edema was now extending forward all the way to her front legs. Kate also continued to drip steadily from her left teat (and she had developed a tiny hole in the side of her udder that would spray a thin stream of fluid if the pressure from the edema got too great). I was concerned she might be losing protein through this fluid but it did not contain any protein when I tested it. It seemed Kate's vital force was simply using the teat to drain the excess fluid from the surrounding tissues. After the 10-day course of antibiotics, we did not see much change in Kate's condition but she was no worse and we were to a point in her pregnancy where we felt the foal would survive even if it was born early. After trying several homeopathic remedies to address Kate's symptoms I decided to give her the homeopathic remedy Apis. The edema was becoming a major concern as it was forming a five-to-six inch layer along Kate's belly all the way to her front legs. I started Kate on one tablespoon of blue-green algae three times a day to get good protein into her system. We were giving her alfalfa hay but Kate was gaining weight so we needed to limit it. After stopping the antibiotics we started Kate on beta-glucan to continue to support her immune system. Kate was a great patient and she would stick her head out the stall door to get all of her medications. After 24 hours on the homeopathic remedy Apis 1M, which we gave every 12 hours, the edema started to decrease. Kate continued to drip from her left teat but at a slower rate. Any attempt to decrease the frequency of the Apis caused the dripping to increase. Gradually, over a week's time, the edema along Kate's belly decreased to almost nothing but the teat continued to drip fluid. Kate was still gaining weigh so we decreased the blue-green algae and added some kelp. Kate was now completely off all drugs, although she was still getting the Apis. She was also getting close to her due date so we started turning her out to pasture. On Tuesday evening, April 22, Kate waxed on her right teat and the left teat stopped dripping for the first time in four weeks. We were sure she would foal that evening but the next morning the left teat was once again slowly dripping fluid. On Thursday morning, April 24, Kate laid down in the pasture at 10 am and foaled a healthy colt. The colt was up and nursing within an hour and Kate passed her placenta about an hour and a half after foaling. The placenta did look a bit infected but it was a normal weight and thickness. Kate had no unusual discharge and was clear on her culture in her 30-day heat. Kate was a really tough case and also a great example of how it is possible to combine natural and conventional treatments and diagnostics to have a good outcome.